Above and Beyond Delivery's primary goal is to provide our clients impeccable service each and every time. We own our fleet of trucks, with all of our assets equipped with insulation / climate control, GPS and remote locks. This is an important distinction when it comes to the ability to provide exceptional and reliable service. 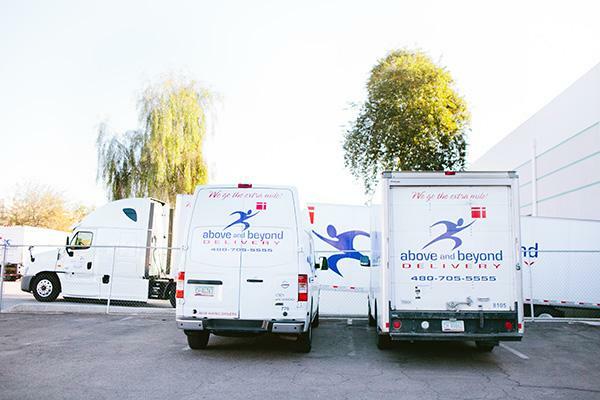 Above and Beyond Delivery employs full-time uniformed drivers, who become your regular and consistent driver throughout our work as your delivery trucking partner. Not all trucking companies are created equal. Be sure to ask the very important questions which will improve your company's bottom line through time saved and savings in operational costs. Above and Beyond Delivery offers a complete array of courier, messenger, delivery, and third-party logistics services specifically customized to your needs. Every business must move products, whether it is delivering or receiving stock. We work with companies as your delivery partner in a variety of industries. Above and Beyond Delivery can manage all aspects of your company’s delivery and receiving shipping needs. We focus on Arizona, New Mexico, Denver, California, Hawaii and the West Coast while our freight forwarding division can provide national and global service.